Size (inches): 0.98" X 0.98" X 1.97"
Bergamot oil has a scent that is sweet, lively, citrus, and fruity; it is characterized as a top note scent that has an odor intensity of about two out of five. Blending companions include florals, geranium, and coriander. This oil can be used as an antiseptic, a skin astringent, a relaxant, or a digestive tonic. Its uses in relieving emotional conditions include depression and anxiety. Bergamot was named after the Italian city of Bergamot, and it is a classic eau de cologne scent. It is also used to flavor Earl Grey tea. A small evergreen tree growing to a height of around 15 feet (4.5 m). The pear-shaped fruit ripen from green to yellow, rather like miniature oranges in appearance. Like other citrus trees, bergamot is native to tropical Asia. Most of the oil is produced in Southern Italy. Cold expression of the rind of the fruit. A pale green liquid. The aroma is delightfully citrus with just a hint of spice. Its odour effect is uplifting and refreshing. Linalyl, acetate, linalol, sequiterpenes, terpenes, furocoumarins. Antidepressant, antiseptic (pulmonary, genitourinary), antispasmodic, anti-toxic, carminative, diuretic, deodorant, febrifugal, laxative, parasiticidal, rubefacient, stimulant, stomachic, tonic, vermifugal, vulnerary. Colds and flu, fever, infectious illness, anxiety, depression, pre-menstrual syndrome. Other citrus oils, angelica, basil, cedarwood, chamomile (German and Roman), clary sage, lavender, neroli, cypress, elemi, geranium, jasmine, juniper, coriander, ginger, frankincense, oakmoss, rose, sandalwood, vetiver. 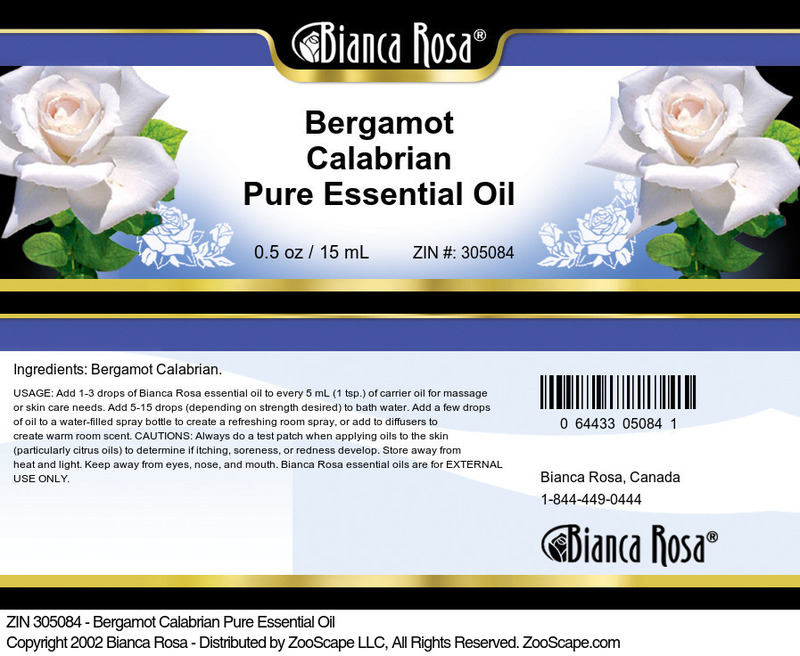 *Note: Bergamot Calabrian Pure Essential Oil is not to be taken internally. Bee balm is known by many other names: bergamot, Oswego tea, monarda, blue balm, scarlet monarda, high balm, low balm, mountain balm, and mountain mint. The genus name Monarda honors the sixteenth-century Spanish botanist and physician Nicolas Monardes, who wrote about medicinal and useful herbs. Bee balm is a true American wildflower and a member of the mint family. Its native habitats are moist areas and stream banks, and it is found from Georgia and Tennessee northward and as far west as Michigan and Ontario. Native Americans and early settlers made a hot beverage of the leaves and flowers of the red-flowered monarda. It became a special favorite after the Boston Tea Party - it was the closest taste substitute for China tea. Bee balm is said to relieve nausea, vomiting, and flatulence. Because it is rich in a substance called thymol, the herb is used extensively in modern medicine and dentistry as an aromatic antiseptic. Plant: Perennial. Its hard, square, grooved stems have 3- to 6-inch rough, dark, paired leaves branching off from them. The delightful, scarlet, two-lipped flowers are beloved by long-tongued bumblebees, butterflies, and hummingbirds but are the despair of honeybees, who cannot reach the nectar deep in the flowers. Flowers bloom in solitary terminal heads, July to September. Height: 1 to 3 feet. Soil: Moist, swamp-type soil; moderately acid. Propagation: By stem cuttings, root divisions, or seeds planted during the third lunar phase. Make root divisions in the spring; later divisions are apt to winterkill. Care: Mature plants should be spaced 18 inches apart. Plants spread quickly, so take them up every three years, divide, and reset.. Replant only outside, newer roots; discard exhausted central plants. To increase flower size, do not let plants bloom the first summer. In successive years, cut back plant after it blossoms; it will flower again in early autumn. Late in autumn, cut down stalks and cover roots with enriched soil. Parts Used for Tea: Leaves, flowers. Wash flowers well in order to float out insects. The bergamots are native to North America. The plant has a pleasant smell of oranges and is strongly attractive to bees. Besides the most common red bergamot, there is wild bergamot (M. fistulosa), native to southern Canada and the northern United States, and lemon bergamot (M. citriodora), which, too, has a strong citrus aroma. The Oswega tribe used bergamot, and Oswega tea was made by colonists at the time of the Boston Tea Party in order to boycott British imports. The plant, a herbaceous perennial, will grow to a height of 36 inches, with a spread of over 12 inches. The fibrous roots form a thick, dense block. The dark green leaves, which may be tinged with red, are hairy and up to 16 inches long. The flowers, up to 2 inches long, are borne in thick clusters at the top of the stem from mid- to late summer. The plants may be grown from seed planted in spring or from root divisions taken in spring or fall. They like sunny position and moist but well-drained soil. Fresh leaves may be used sparingly in salads, fruit salad, and fruit drinks, and fresh or dried leaves can be made into a refreshing and relaxing tea that is said to be soporific. The dried leaves lend a pleasantly citrus aroma to potpourri. Bee balm or red bergamot has no cosmetic values but should not be confused with bergamot oil which is a cosmetic oil extracted from the rind of a bitter orange tree and which is used in toilet waters and body oils. At some time the confusion may have arisen because red bergamot has a distinct orange smell. Medicinally, the leaves can be used to help relieve nausea, flatulence, and menstrual pain. Bergamot can also be used in cases of catarrh as a steam inhalation. Expressed bergamot oil is phototoxic because it contains high levels of furocoumarins. It should never be applied to skin shortly before exposure to natural or simulated sunlight. Aromatherapists are increasingly using the rectified version known as bergamot FCF (furocourmarin-free), which is non-phototoxic. It is also free of other non-volatile substances, such as waxes, which can irritate sensitive skin. Bergamot is perhaps the most photosensitizing of all the citrus oils. However, a bergaptene-free essential oil, which is not photosensitizing, is available. This oil may be labeled "FCF bergamot" The acronym stands for "furanocoumarin-free".